This traditional hamantaschen recipe makes enough for you to give to friends and family on Purim. Photo by Josh Bousel, courtesy of Flickr, under a CC by 2.0 license. 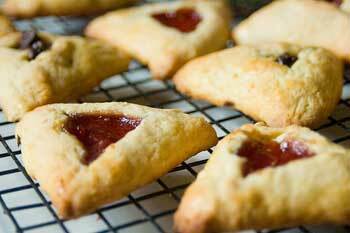 A hamantash is a three cornered pastry that is a traditional part of Purim, one of the most fun Jewish holidays. The plural is hamantaschen, and many people use it to refer to only one hamantash, as in, "Would you like to eat a homemade hamentaschen?" An important tradition of Purim is the sending of gifts of food to friends, family and neighbors. Each person has to send a gift of two ready-to-eat foods to at least one person. Of course, most people don't stop at one gift – they send as many parcels of food as they can. Hamentaschen are one of the pastries usually included in these food parcels (called mishloach manot). They're named after Haman, the villain of the Purim story and are tricornered, like some old-fashioned hats. Villians or not, these cookies are totally good and yummy, and they’re fun to make with kids. To make the filling, slice open and check apricots. Place in a saucepan with orange juice, honey and zest. Bring to a boil, then simmer until no longer liquid. Cool, then run through blender. Other traditional hamantaschen fillings include lekvar (prune spread) and poppy seed filling. In Israel, date spread is also a popular option. In a pinch, use jam or marmalade. To give the filling an added layer of flavor and texture, mix in some finely chopped nuts. Beat the eggs with the sugar. Mix in oil, lemon, lemon rind and vanilla. Working with one section at a time, roll dough to 1/8 inch thickness. Cut into circles using a 7-cm (2½ to 3-inch) cookie cutter or glass. Place 1 tsp of filling in the center of each circle. Fold three sides of the circle over the filling, leaving the center open. Pinch the three corners so the dough sticks together. You should have a triangular shaped hamentasch. Place the hamentaschen on greased cookie sheet and bake for about 20 minutes. This hamantaschen recipe was adapted from recipes at Chabad.org's Purim Central, where you can find more Purim recipes, holiday-how-tos, customs and kids' Purim crafts and games.